Ask any search marketer what Google's market share is, and they'll likely say around 66%. That's the stat comScore has long supplied. Contributor Eli Schwartz asks whether it's really accurate. Every month, comScore releases its U.S. search engine market share reports, and these reports are widely shared by media outlets as the definitive source of search engine penetration. Over the past couple of years, comScore reports have declared Google to be at a 65-68% market share, with most of the remainder divided up between Bing and Yahoo. Yet, these numbers don’t seem to align with what I’ve seen in multiple analytics reports, which place Google at closer to 85-90%. Faced with two conflicting sets of search engine market share numbers, I wanted to understand whose search engine market share numbers were more accurate. To achieve this goal, I drafted a survey to capture a holistic view of users’ search engine behaviors to try to get the most accurate measure of their search engine loyalties. Users were queried about their awareness of search engines. Small search engines like Blekko and DuckDuckGo, as well as international ones like Yandex, Naver and Baidu, were included alongside the major engines (Google, Bing and Yahoo). 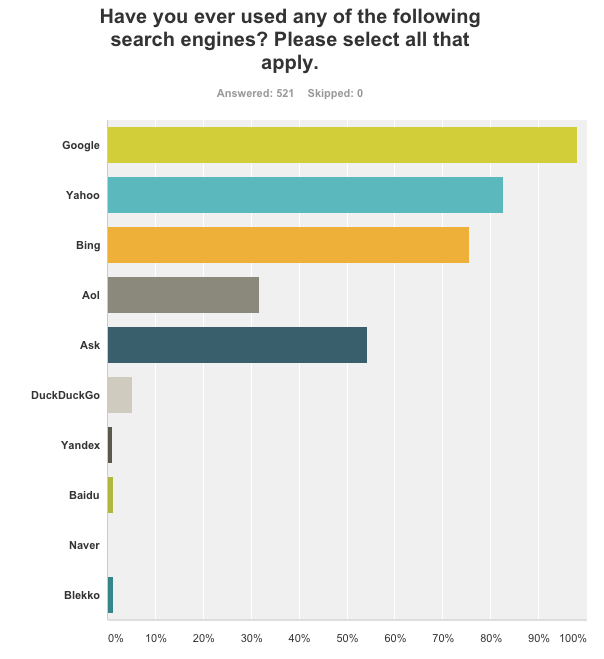 I asked users about their primary search engine and also how often they use each search engine. There were additional questions in the survey about the types of operating systems they use on their computer and questions about the technology of their mobile device. I launched the survey using my employer’s SurveyMonkey Audience on a Friday, and by Monday I had achieved my statistically significant target of 500+ survey respondents in the United States. A proper sample set is essential when conducting any survey that attempts to draw conclusions about people’s general behavior and preferences. And in this case, 350 is the minimum number of respondents I needed in order to capture a representative sample of all people in the U.S.
Additionally, in order for a sample to be valid, the respondents have to be chosen completely at random. SurveyMonkey Audience recruits its 4 million+ members from SurveyMonkey’s 40 million annual unique visitors, and members are not paid for their participation. Instead, they are rewarded for taking surveys with charitable donations, made on their behalf by SurveyMonkey. When tested against much larger research projects, Audience data has been exactly in line with larger sample sizes. For example, an Audience survey with just 400 respondents about a new Lay’s potato chip flavor had the same results as a wider contest that had 3 million participants. SurveyMonkey’s survey research team was also able to use SurveyMonkey Audience to accurately predict election results in both 2012 and 2013. With my sample size of 521 respondents drawn at random, my search engine market share rates should reliably mirror the actual reality. Here’s what I found. What is interesting in these statistics is that part of Bing’s marketing push seems to be aimed at getting users to just give Bing a try. This is evident in campaigns like its BingItOn challenge, and even its current Bing Rewards program, which rewards users just for searching. It seems that the real challenge is not to get users to try Bing, but to keep them using it. These figures seem far more in line with expected results based on my experiences with analytics reporting tools. Why Does Accurate Search Engine Market Share Even Matter? As you can see, the search engine usage percentage numbers you see in your analytics might be more accurate than the figures reported by comScore. Accurate search engine market share should be a significant factor in how users allocate their time and budget. If Bing/Yahoo’s market share is actually 29%, as comScore stated in its August 2014 report, shouldn’t PPC marketers spend at least a third of their time on Bing Campaigns? Similarly for SEO, if Bing/Yahoo’s market share is so large, at least being aware of where a site ranks on Bing should be important. There should be as much attention paid to the latest algorithm updates coming out from Microsoft as there is for the updates from Google. Judging from the social popularity of Search Engine Land posts on Bing updates vs. those from Google, it is apparent that marketers don’t seem to put much faith in the market share numbers reported by comScore. This is likely because most marketers see markedly different search engine usage numbers in their own analytics software. The discrepancy between what web analytics packages show and what comScore reports declare could stem from how comScore develops its stats. The company generates its reach reports from a panel-based audience that installs tracking software on their computers and then marries this dataset with data that comes from a tracking beacon installed on millions of websites. Nonetheless, even with the comScore tracker on so many websites, comScore still needs to use weightings against demographics in order to generate full population assumptions. It is these calculations that might lead to some inconsistencies with actual search engine market share. Knowing that Google’s market penetration is a lot closer to what most marketers believed already should justify continuing to focus the majority of time and budgets on Google. However, Google’s dominance is only a general average, and usage might be different for a particular website or audience. An older target audience could very well be using Bing on a desktop to search online, while a younger audience is more likely to be using Google on a smartphone. Disregarding published market share reports and paying attention to a target audience’s individual search and technology preferences should really be the driver of how marketers spend their time and budget.